If your child suffers from chronic sore throat, recurring ear infections, or difficulty breathing, the doctors at Chesapeake Ear, Nose & Throat can determine if tonsil or adenoid infections are at the root of the problem. Our doctors will begin with conservative care, typically treating infection with antibiotics. 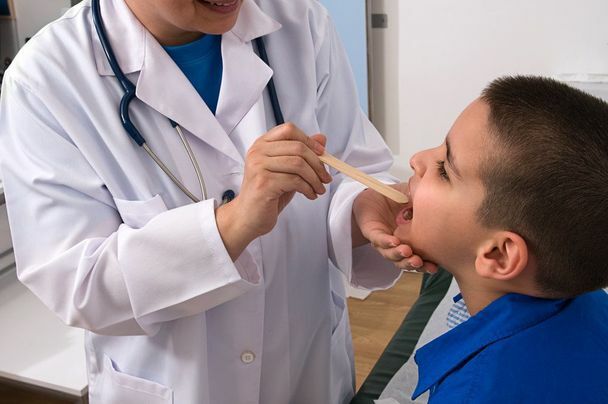 However, if your child suffers from recurring tonsils and adenoid infections, our Baltimore, MD, team may recommend tonsil or adenoid removal. Our compassionate and experienced doctors will help you and your child prepare for the upcoming procedure. What Causes Tonsil and Adenoid Infections? Tonsils are the two small masses of tissue found at the back of the throat. Adenoids are similar, but since they are located behind the nose and soft palate, they are not visible to the eye. Scientists believe that tonsils and adenoids produce antibodies and help to combat bacteria as they enter through the airways. However, the glands seem to play the biggest role during the first year of life. As children get older, they can be less beneficial and become problematic. Tonsils and adenoids are two of the first parts of the body to encounter bacteria and irritants, making them prone to infection. Children are far more likely to develop adenoid infections than adults. This is because the adenoids shrink as children get older. By the time they reach their teenage years, adenoids are virtually non-existent. The first few times that your child develops a tonsil or adenoid infection, we will usually treat the condition with antibiotics. If your child develops recurring infections, a tonsillectomy or adenoidectomy may be appropriate. In many cases, our doctors will perform a combined procedure to remove both at the same time. With our specialized services for pediatric patients, we know that children may feel nervous about their upcoming treatment. Prior to their procedure, we will explain everything to your child in language that they can understand. We will do everything possible to help your child relax on the day of the surgery. We encourage kids to bring a favorite stuffed animal or blanket to their appointment. Parents are, of course, encouraged to stay with their child during their procedure. Before the procedure, we will administer general anesthesia, so that your child will be asleep and relaxed the entire time. Then the surgeon will carefully remove the tonsils and/or adenoids. The surgeon will work carefully to avoid disturbing the surrounding tissues, and as the final step, will cauterize the treatment area to prevent bleeding. Typically, children recover very quickly. Therefore, they will usually be ready to return to school and normal activities within two weeks. Tonsil and adenoid removal is a common medical procedure that has been performed for many years. With advances in technology, the two surgeries involve negligible risks. We will carefully monitor your child’s recovery to ensure their complete safety. After a tonsillectomy or adenoidectomy, your child should get plenty of rest for the first week. For the first two weeks, your child should avoid running and other strenuous physical activity. Typically, children recover very quickly. Therefore, they will usually be ready to return to school and normal activities within two weeks. If your child is suffering from the symptoms of a tonsil or adenoid infection, such as chronic sore throat, recurring ear infections, or difficulty breathing, we can relieve his or her discomfort through proper treatment. Contact our office today to schedule a consultation.